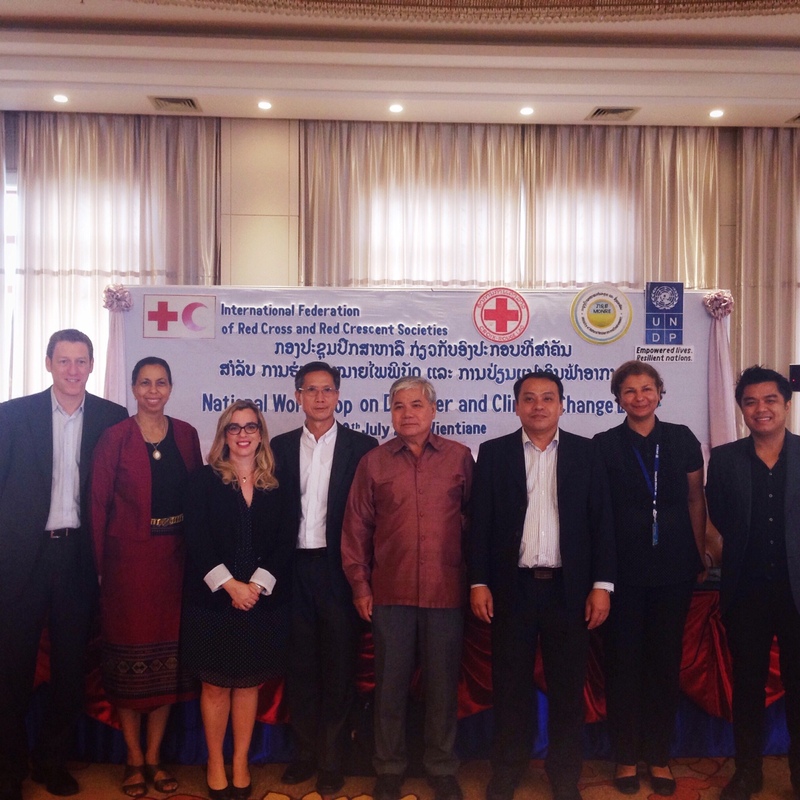 Last week I traveled to Vientiane, Laos, to give a presentation at the National Workshop on Disaster and Climate Change Law. 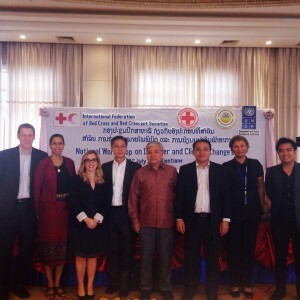 The workshop, convened by the United Nations Development Program (UNDP), the International Federation of Red Cross & Red Crescent Societies (IFRC) Disaster Law Program, and the government of Laos, is one step in a multi-year legislative process that will design (and hopefully implement) an integrated approach to disaster risk management (DRM) and climate change adaptation (CCA). Though DRM and CCA have typically been addressed separately—by different agencies or ministries operating under different statutory or decreed mandates in nations around the world—policymakers are beginning to recognize the benefits of looking at them together. This post takes a minute to talk about why, and to think out loud about what principles might guide integration efforts moving forward. International climate change and disaster law both give currency to the notion of integration. The UNFCCC’s Bali Action Plan and Cancun Agreements explicitly place disaster risk reduction (which along with disaster response and disaster recovery constitute “disaster risk management”) in the context of the international commitment to enhanced action on adaptation. At the same time, the two international DRM soft law instruments—the Hyogo Framework for Action (in effect from 2005-2015) and the follow-up Sendai Framework for Disaster Risk Reduction (for the years 2015-2030)—identify climate change as an underlying disaster risk to be addressed in DRM. The Sendai Agreement states that adequate disaster preparation requires looking at future climate scenarios at the global, regional, national, and local levels. There are real benefits to be gained from an integrated approach to DRM and adaptation. Most importantly, an integrated approach leverages existing institutional knowledge and political support to promote both goals. Many of the strategies and tools overlap, especially for disaster risk reduction and adaptation. Elevating homes in floodplains, securing steep slopes in watersheds, providing buffers from wildfires in fringe zones, securing water supplies in drought-prone areas, and improving livelihoods in impoverished communities can all reduce the risk of disaster conditions resulting from extreme events while helping communities adapt to long-term climate change impacts. An integrated approach can create opportunities for greater organizational coordination and overall efficiency, with improved results on both fronts. Like many “least developed countries” Laos is highly sensitive to climate change impacts—especially more frequent and intense droughts, storms, and flood events—and it is not alone in seeking to develop an integrated legislative approach. The Philippines, Vietnam, Micronesia, the Solomon Islands, Vanuatu, Mexico, Namibia, New Zealand, and Algeria have all taken steps along similar lines. Different countries, of course, are doing different things. Neighboring Vietnam’s Law on Natural Disaster Prevention and Control (2013) requires that the national and sub-national DRM plans rely on disaster risk assessments as well as climate change projections. Similarly, the Philippine Disaster Risk Reduction and Management Act (2010) makes climate projections and climate change resilience components of the nation’s overall DRM policy and plan, calls for the mainstreaming of adaptation and DRM in the nation’s development policies, and requires collaboration between the National Disaster Risk Reduction and Management Office and the Climate Change Commission. Other countries’ laws are less comprehensive, but nonetheless connect the dots. Mexico’s General Law on Civil Protection (2012), the country’s primary law on DRM, states that climate change is a “civil protection priority.” New Zealand’s Resource Management Act provides for inclusion of climate effects on flood flows in the country’s natural hazards management regime. In looking at these national laws, a few recurrent themes emerge: the allocation of authority to new bodies to coordinate DRM and CCA or the requirement that existing bodies work together in specific ways; the inclusion of climate projections in disaster and hazard risk assessment; information disclosure and public participation requirements; and last but far from least, the provision of funding to carry out the tasks at hand. In Vientiane, I discussed these structural elements, along with a few other issues. During the Q&A session that followed someone asked what the best policy would be to deal with both DRM and climate change. That is, beyond the institutional structure, what should actually happen? Like many others who have written on the topic of adaptation I defaulted to the idea that “no regrets” adaptation actions are the most likely and best first steps. “No regrets” measures are those that would make sense even in the absence of climate change – installing improved water supply systems in rural areas that suffer from water scarcity, for instance. These types of measures can address the most pressing disaster risks, while also accounting for future climatic conditions and extreme events. On further reflection, though, I believe there are three other principles that ought to guide the integration of DRM and climate change adaptation in Lao PDR and elsewhere: planning, preservation, and resilient recovery. Planning is perhaps the most obvious approach, and it is clearly reflected in the legislation that has been enacted so far. The basic idea is that given the cross-sectoral salience of climate change, planning efforts—whether for disaster management, hazard mitigation, natural resources management, energy, stormwater, zoning, buildings, etc.—should incorporate projected climate change impacts. This requires technical assistance and capacity building at multiple levels, so legislation should provide for that. Preservation is also quite obvious, even if the conceptual terrain of preservation in the age of climate change has become contested. The basic idea here is that existing ecosystems—from large-scale coastal regions to individual wetlands and river banks—should be preserved as a first, best option to reduce disaster and climate risk. In many instances preservation is not possible, and in those circumstances the choice will become whether to restore ecosystems to an historic baseline or else to construct some “natural infrastructure” that will provide a comparable level of protective ecosystem services. Resilient recovery focuses on actions that take place after disasters happen. Speaking at a high level of generality, domestic and international disaster recovery has traditionally focused on rebuilding to the status quo ante. Where disasters are attributable to climate-related extreme events—and not, for instance, to earthquakes or violence—governments, international organizations, and NGOs providing recovery assistance should adopt an approach that accounts for resilience to future events and conditions. The Sendai Framework has started on this path, making “building back better” a priority for the new DRM regime. The U.S. has also taken some steps in this direction. The National Disaster Recovery Framework published by FEMA, for example, names resilience to future disasters and sustainability as core principles (though without making any specific mention of climate change), and the new Federal Flood Risk Management Standard identifies specific climate-sensitive elevation and setback requirements for federally-funded projects, including disaster recovery. These approaches should become pervasive. After four days of meetings and events in the nation’s capital I traveled to the small city of Luang Prabang, a UNESCO World Heritage site upstream from Vientiane at the confluence of the Mekong and Nam Khan rivers. It is the wet season in Laos, and it rained constantly while I was there, as it always has at this time of year. The current projections call for the rains to come in more intense bursts in the years ahead. Looking at the (untreated) stormwater channeled into the river and the steep slopes for miles all around, an integrated framework for assessing and addressing disaster and climate seemed to make a lot of sense. It will take Laos a few years to pass any legislation. Once that framework is in place it can turn to the arguably trickier issue of implementation.